[By Nick] Happy Friday everyone! I'm going to keep this one short and sweet because we all know who Coolhaus is and I've already reviewed the ice cream that goes into this sandwich. So let's get right into this sandwich I picked up from the Niskayuna Co-op so you guys can get back to your plans. So I'm a big fan of snickerdoodle cookies and Coolhaus does not disappoint here. I will never understand how they manage to keep their cookies so soft and moist in the freezer. It's like black magic and I'm in love with it. The cookies are perfectly spiced without the cinnamon being too powerful. They're just chewy cinnamon sugary deliciousness. Add in the salted caramel ice cream and this is a combo I'd like to see more of. The ice cream's saltiness lends itself well to the sweetness of the cookies and balances everything out. We all know cinnamon and caramel work together and that's nothing different here. The salted caramel just takes the combo to a different level. 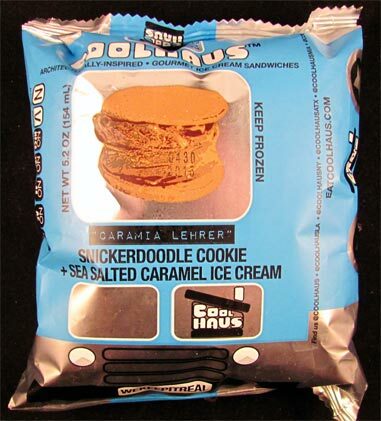 While I prefer their bacon sandwich more, this is another winner from Coolhaus! Verdict? I want another sandwich...right now. 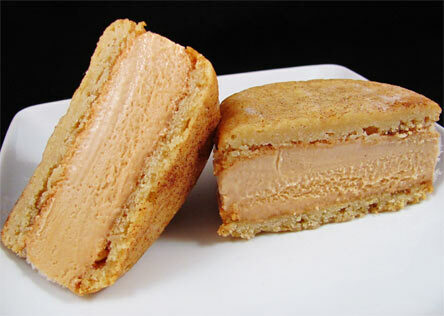 I wonder why they could attempt a macaron cookie sandwich? None of the ice cream companies has attempted it. Instead of jam they could fill it with ice cream. Danielle, Whole Foods or just go to the city. You're so close to their actual truck aha. Alek, I mean mini ice cream sandwiches aren't new. I think coolhaus wouldn't be the brand to make them because they're not about tiny things. It's a novel idea that I bet has been thrown around by companies but it might be too hard to properly execute since macaroon shells can be delicate as well. Giant started carrying this brand! Tried the Snickerdoodle sandwich & it was amazing. $3.99 or $4.99 (can't remember the price) is a bit expensive though for one sandwich.